No matter how how loud it roars – March is finally here! You may think I have surrendered. Far from it. Instead, I rejoice. Doubt you may, as you bluster. To sweeter days that lie ahead. I meant to write this post yesterday but got barreled down by laryngitis and a bad head cold. The funny thing is I was sick last week too. Oh, and a couple of weeks before that. And then in January…well, I won’t go into details about how sick my entire family was. Let’s just say I wouldn’t have wished our illness on anyone. Simply put, my family has been on one big ride of sick this winter. I know we’re not alone in this either. Tons of friends and family unwillingly hopped on this train too. Yes, this winter has been one big blegh, cough and sneeze. It’s why I’m so glad it’s March! I don’t care how stormy and miserable the weather will be this month. Nope, I don’t. Because no matter how loud it roars – the arrival of March means spring is just around the corner. So this month, winter can bluster and blow and gust out its last breath all it wants. I don’t care. Bring it on Old Man Winter. Bring it on. This post incorporates Six Word Fridays because I meant to write much earlier this week but was too under the weather. Get it? Under the weather. Yes indeed, I really know how to push a theme to its limits. Hey, now would be a great time to check out Melissa’s blog for some unique takes on the concept of surrender. * Old Man Winter image credit to KojinkaLuigiGodzilla via Deviantart.com. I am happy that March is here…for your sake. Feel better 🙂 and I hope warmth comes your way. I enjoyed your verse on the topic surrender. 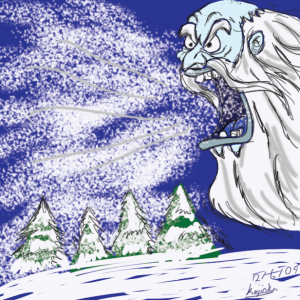 The illustration of ‘old man winter’ brought a smile to my face also. I liked that Old Man Winter illustration too. That blustery old guy needs to go on vacation! I long for spring, too. PS. I hope that you all feel better very soon. We’ve been on that train for a week now. Good times… er. um. not really. Winter and sickness need to go away! Give me daffodils and tulips and sun-shiny days soon. We surrendered to the sick all winter. I’m ready for spring! Yep, enough is enough. Thanks Melissa! It’s days are numbered…love that! Hope you are all on the mend. Yes, it’s going around here, too. I really hate March, that in-between month, but yes, it signals spring is coming! Get well!